Horizon Place - main floor 1288 sq.ft. 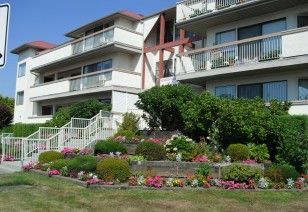 bright spacious 2 bedroom 2 bath unit. Super location - this 55+ complex is walking distance to 7 Oaks Shopping and Mill Lake. Storage room right off foyer, laundry in hallway closet, full length covered balcony w/storage plus storage locker in basement. Lovely kitchen w/oak cabinets, dbl sink overlook living room, roll-out drawers, big eating area. Large living room w/patio doors to balcony. Main bath w/vanity, walk-in shower & linen closet. MBR w/2 closets & 4 pc ensuite; MBR DRAPES DO NOT STAY. Crown mouldings. 1 U/G parking stall, no pets, no rentals.